Okay, yes, I know. This thing is in rough shape. But let’s step back from condition issues and think about something: when was the last time you saw a World War One vehicle? What about one for sale? What about one for sale in original condition? Wartime vehicles generally don’t even survive the war, yet alone the one hundred years that follow. World War Two trucks can be found with relative ease. But there’s something so inaccessible about the “War to End All Wars.” Maybe because so many vehicles from that era were scrapped to build things to fight the Nazis. Maybe it’s because no one from that era is still alive (but were as of recently). This truck just blows my mind. The Quad was designed by Thomas B. Jeffrey and was built as the Jeffrey Quad beginning in 1913. The thing is amazing for the time: it has a 5.2-liter straight-four engine making 29 horsepower and driving all four wheels with solid tires. Top speed is about 15 mph. It also has four-wheel brakes (an absolute rarity in 1913) and four-wheel steering. Four-wheel drive vehicles existed prior to this, but none were this solid or well built. They started out as delivery trucks popular (especially in rural areas) in the U.S. In 1914, war broke out and production picked up (thousands – 11,000+ – were built in total, exact figures unknown). In 1916, Nash Motors acquired Jeffrey and continued production of the Quad as the Nash Quad. So this thing is from the first year of Nash production. This was undoubtedly a wartime truck. Other Quads exist – some in pristine, restored condition. But you won’t find one “straight out of the war,” so to speak. The engine turns over but it doesn’t run and it could be restored. It’s one of only three in France (if that means anything to you). It was discovered as-is in the 1980s – but think of the life it lived – the people it may have carried into battle – and now none of them are still alive today. It’s a piece of history from another time and so, so cool. It should sell for between $10,000-$20,000. Click here for more info and photos and here for more from Artcurial. 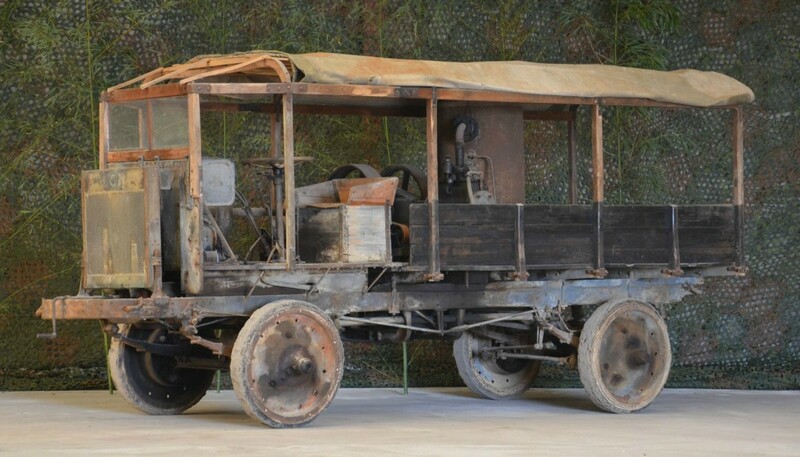 This entry was posted in Uncategorized and tagged 1916, artcurial, auctions, cars, classic cars, nash, quad, truck, trucks, world war 1 by classiccarweekly. Bookmark the permalink.